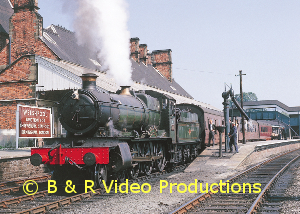 The fifth part in our “Steam Still at Work” series of films which mostly features the steam scene both at home and overseas after the end of main line steam on British Railways in 1968. 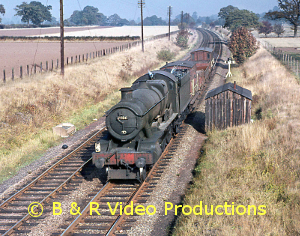 The series continues until the “Return to Steam” tours on BR in October 1971. We begin in Kent during 1969 where Mogul U-class 2-6-0 No.31618 (the 2nd locomotive rescued from Barry scrapyard) is seen near Maidstone, followed by the first of two journeys to the Ashford Steam Centre where there is a strong South Eastern & Chatham representation. 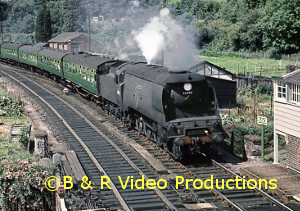 We next visit Bridgnorth during 1965 at the very beginning of the Severn Valley Railway followed by scenes of the early days of workings to Hampton Loade featuring Nos.46443, 3205, 8233, 43106, and GWR railcar 22. Many ex-GWR pannier tanks found a new commercial working life after BR and visits are made to see them on London Transport (No.L92) and on the NCB at Coventry (No.1502), Merthyr Vale (No.9600), and Mountain Ash (No.7754) collieries. In South Wales further NCB sites seen are Hafodyrynys, Celynen South, Brynlliw, and Maesteg. Although not steam, another system of interest to enthusiasts visited at the end of 1969 was the “Woodhead” electrified system from Manchester to Sheffield Victoria. Next we visit the Dart Valley Railway in May 1970 with its first ever through trains from the BR network – one by the LCGB with Praire No.4555 & Pannier No.1638 and the other one by Ian Allan with 0-4-2T No.1420 & again No.1638. Further locations include Quainton Road, Bulmer’s at Hereford, Carnforth, Tyseley, and the Bluebell Railway on the occasion of their tenth anniversary. In North Wales visits are also made to the Welshpool & Llanfair (including the Legendary “Monarch” 0-4-4-0), Talyllyn and Vale of Rheidol railways. Steam could also still be found across the Channel. We visit the last entirely steam-worked terminus in Paris at Gare-de-la-Bastille using 2-8-2 tanks during December 1969 plus also near Boissy and Vincennes. A trip was also organised to North Germany by the LCGB in April 1970 and includes Lingen (with a visit to the locomotive works) and Emden. Motive power features double-headed 011 Pacifics, Nos. 012, 023, and even an 082 0-10-0 tank. The archive film is entirely in colour. An authentic sound track has been added along with a commentary to complement our nostalgic look at this period from 1969 to 1970. Cover photo:- Colin White, Andrew-Barclay 0-4-0ST No.8 at Celynen Colliery, June 1970. The third volume in our popular “Miscellany” series to cover Southern steam. It again features previously unseen footage from the Jim Clemens Collection mostly compiled in the order the film runs off the original cine reels. 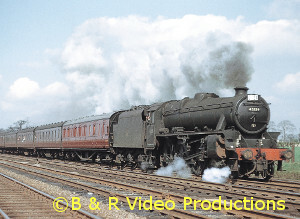 Here we feature more steam mostly from the South Western Division including some rare footage. Locations include London Waterloo, Woking, Basingstoke, Battledown Flyover, Sailsbury, Micheldever, Eastleigh, Southampton, Brockenhurst, Lymington Junction, Christchurch, Bournemouth, Poole, Dorchester South and its strange operating procedure for up services, Upwey Wishing Well Halt, Upwey & Broadwey and Weymouth. Oxford is the starting point in the summer of 1965 for two trips on the southbound ‘Pines Express’. 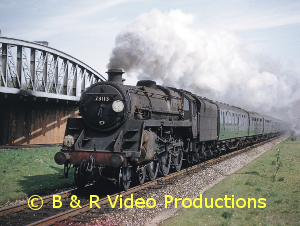 A last journey is made in December 1965 over the Somerset & Dorset Railway from Templecombe to Bournemouth. In the far west we visit the Axminster to Lyme Regis branch, Seaton Junction, Sidmouth Junction, Tipton St Johns, Budleigh Salterton, the Bere Alston to Callington branch, Exeter to Okehampton, Meldon Viaduct and Halwill, plus the North Devon & Cornwall Junction Light Railway through Hatherleigh and Petrockstow to Torrington and onwards to Barnstaple Victoria Road. The archive film is entirely in colour and covers the years from about 1963 to 1967. An authentic sound track has been added along with an informative commentary to complement this nostalgic look at the last years of Southern steam. Cover Photo:- Keith Pirt/Courtesy of Book Law Publications, 73116 passing Worting Junction, March 1960. The fourth in our popular electric and diesel miscellany series. 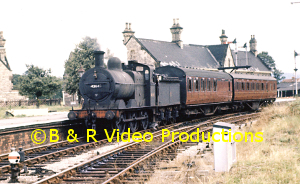 Although the “classic traction” seen in this series is “modern” compared to “steam traction” it should be remembered that much of the footage is 50 years or more older having been taken during the period from the 1960s to the 1980s. Most of the scenes selected have not been previously seen. As before with these films, we have simply compiled them in no particular order and thus a few surprises will be in store as you enjoy the video. A vast area of the country is covered from HSTs and Class 50s in the West Country, to the Midlands at Wichnor sidings, Bescot and then across to Norwich, with numerous other locations in between including Cosford and the Madeley route. We watch high speed operations on both the East Coast Main Line (ECML) and West Coast Main Line (WCML) before moving southwards to Stonehouse Junction on the Birmingham to Bristol main line for scenes including glimpses in the signal box and a Class 14 on the nearby Nailsworth branch (closed in 1966). A couple of rail incidents are covered at Catholme Level Crossing and near Lichfield, followed by a visit to Derby Works during the 1968 Open day. More action is seen on the Great Western Main Line at Reading, Taplow and Acton. In London, we visit King’s Cross, St Pancras and Waterloo. Northwards again for footage around Shrewsbury which includes a couple of Crewe test trains. The reopening of Barmouth Bridge is also touched on, plus a few scenes from around the long demolished Buxton Lime Works. Manchester Victoria is also visited. Classes covered include Brush Type 4s in both two-tone green and corporate blueliveries, English Electric Type 4s, again in green and blue plus we cover their last days in service in 1984. Blue Pullmans are seen as well as their HST successors. AC Electrics are in in action as well as Deltics at King’s Cross and at speed on the main line. Passenger and freight trains pass by, including a number of car­carriers. We see Classes 03, 08, 14, 20, 31, 33, 35, 37, 40, 44, 45, 47, 50, 52, 55, 73, 74 and virtually all the AC electric types. A couple of steam shots are added for further interest. One or two DMU/EMU scenes are included and a finally a couple of shots include the rarely seen Brake Tenders. All the archive film is in colour and an informative commentary and authentic soundtrack has been added. Cover photo:- Keith Pirt/Courtesy Book Law Publications:- An unidentified Class 37 near Langwith, March 1980. The second volume in our popular “Miscellany” series to covering Southern steam. It again features previously unseen footage from the Jim Clemens Collection and is mostly compiled in the order the film runs off the original cine reels. In this volume we feature a wealth of Southern steam mainly from the South Western Division including some really rare footage. The first 10 minutes or so take us on a journey in the 1930s over the Lynton & Barnstaple narrow gauge railway. In the 1960s, Jim Clemens purchased two 16mm cine reels covering this much missed line and both are included here. Back to standard gauge and we begin at London Waterloo followed by coverage around Clapham Junction, Hook, Basingstoke, Micheldever, Bentley, Bordon, “The Alps” line, Eastleigh station (plus the Shed & Works) and Southampton Central including some views of the liners “Queen Mary” and “Queen Elizabeth” at the Docks. The Warwick Railway Society’s “Farewell to Steam on the LSWR” rail tour on 11th.June 1967 is covered in some detail followed by a journey from Cowes through Newport to Ryde Pier Head on the Isle of Wight. We spend some time on New Year’s Day in 1967 watching the Lymington Branch (the last steam operated branch line in the country). Back on the main line we see activity at Lymington Junction and Brokenhurst. Jim Clemens married in February 1948 and honeymooned in Bournemouth. He often visited this popular seaside resort for an anniversary break. Therefore a considerable amount of film was taken around this area covering the last years of steam including Christchurch, Bournemouth Central and Bournemouth West. We also journey over the old Salisbury & Dorset railway in the snow during 1963 and spend time around Salisbury itself. All followed by a trip in a push-pull train propelled by an M7 0-4-4T along the Swanage Branch from Wareham, Worgret Junction and Corfe Castle! There is also coverage of Dorchester, Upwey & Broadwey and Weymouth including a visit to the Shed. We see a cross-section of 1960s Southern motive power during our travels including locomotives from classes M7, O2, Q, S15, U, USA as well as West Country and Merchant Navy Pacifics. BR Standards also put in an appearance with examples from Class 5 & Class 4 4-6-0s, Class 4 2-6-0s, Class 4 2-6-4Ts, Class 3 2-6-2Ts plus a few LMS Class 2 2-6-2Ts and a “Warship” diesel. 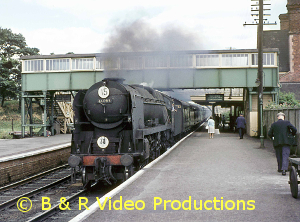 The archive film is in both colour and Black & White and apart from the L & BR footage mostly dates from 1963 to 1967. An authentic sound track has been added along with a commentary to complement this nostalgic look at the last years of Southern steam. Cover photo:- Alan Maund, 34095 “Brentor” arrives at Axminster, Summer 1967. The fourth in our miscellany series covering London Midland steam. Once again we feature much previously unseen film, largely assembled in the order the film runs off the original cine reels with scenes across much of the Region. There is considerable coverage around the North-West including Crewe South Shed, Crewe Station, Crewe Works (with “Western” diesel-hydraulics under construction), Stoke-on-Trent Shed, Moore water troughs, Warrington Bank Quay and Warrington Arpley. A brake van tour of obscure lines around Warrington and Widnes behind Standard 2-6-0 No.76077 includes a refuge siding at Daresbury (part of the original Birkenhead route abandoned with the opening of the Manchester Shop Canal in the 1890s) plus that famous railway curiosity at Widnes, a rail flat crossing by No.4 Signal Box! There is plenty of steam action at Winwick Junction, Wigan North-Western and Wigan Wallgate before we move on to Leyland, Farington Junction, Pleasington and Preston. Further north, we visit Carlisle for scenes at Kingmoor Shed as well as at Citadel Station. South once more and Chester, Gresford Bank, Llangollen Junction (Ruabon) and Hooton are all visited in March 1967 coinciding with the end of the direct Paddington to Birkenhead service. Further south, in 1964, visits are made to the Bletchley flyover, Aynho water troughs, Gloucester, Banbury, the Lickey Incline (including an amazingly long freight train ascending the bank) with summer Saturday holidaymaker trains being seen at Birmingham. Finally, the last fifteen minutes or so are made up of interesting offcuts from Colin White such as Shap, Tebay Shed, Dillicar water troughs, Oxenholme, Carnforth, Hest Bank, Heaton Mersey and Warrington. A cross-section of LM motive power is seen such as Black 5s (including the experimental examples plus one with a self-weighing tender), Jinties, 2-6-4Ts, 4Fs, ‘Princess’ and ‘Coronation’ pacifics, Jubilee, Rebuilt Patriots, 8Fs and a variety of Standard classes including Britannias, Clans, 73xxx, 75xxx, 76xxx and 9Fs (including ex-Crosti boilered). The archive film is in colour and black & white and was filmed between 1963 and 1968. An authentic sound track has been added along with a commentary to complement this further nostalgic look at the last years of London Midland steam. Cover photo:- Keith Pirt/Courtesy Book Law Publications, 45339 returns Excursion C724 from Blackpool to Manchester, near Euxton Jct, Preston, Easter 1961. 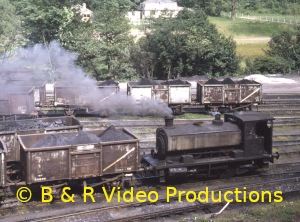 After the success of our previous miscellany of electric and diesel power (as well as the earlier Diesel Hydraulic and Diesel Electric Heyday series) we have delved further into our archives and complied a second miscellany of film clips that were not included in those earlier volumes. There is a whole variety of scenes across all of the UK mainland, most of which have never been seen before and were taken during the 1960s & 1970s, with a few later scenes from the 1980s. We start our journey with scenes at Bangor in North Wales, Shap (with steam bankers! ), Carlisle, Beattock and Carnforth. We visit the Settle & Carlisle and then the London Midland Region around Birmingham and the Lickey Incline, again with steam bankers! The Shrewsbury area is well covered with a number of workings. Back to Scotland for scenes at Fort William, the Mallaig Extension and the Far North line at Georgemas Junction, Thurso and Golspie. Other scenes take in Elgin, the Strathspey line, the Forth Bridge area and Edinburgh Waverley. Returning south, we visit the Woodhead route with its unique electric locomotives before taking a look at the reopening of Barmouth Bridge in 1986. Then once more to the Southern in 1972 for a journey on the Brighton Belle. Down in the West Country we explore some of the long forgotten branches and have scenes around Truro, Par, Penzance, Plymouth and Newton Abbot as well as heading up to Ilfracombe. There are indeed many other scenes too numerous to list here. Virtually all classes of British Railways diesels are seen from Deltics and Warships to diminutive shunters. Electric power includes the EM1s on the Woodhead and those early Southern Bo-Bo electrics. We see DMU and EMU action as well as a number of shots of those infamous 4-wheel rail buses of the 1960s. The prototype HST is seen at Bristol as well as some early liveried HSTs. All the archive film used is in colour and a informative commentary along with an authentic soundtrack has been added. Cover photo:- Keith Pirt/Courtesy Book Law Publications. Peak Type 4 D78 on a Leeds to St.Pancras express near Sheffield Millhouses in 1964.